BookHounds: BookHounds FREEDOM TO READ GIVEAWAY HOP #Win Book Of Your Choice! 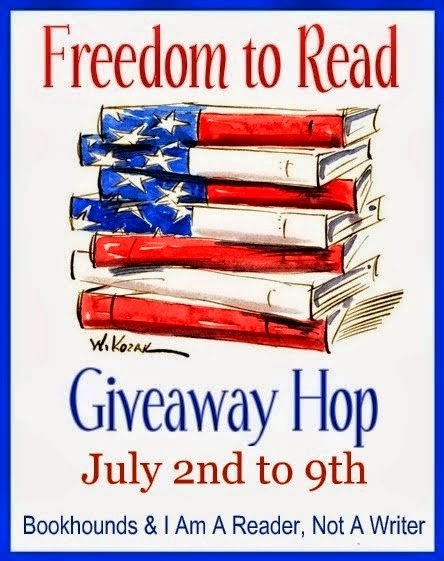 BookHounds FREEDOM TO READ GIVEAWAY HOP #Win Book Of Your Choice! There are a bunch of blogs participating in this one so be sure to stop by each one. Each has their own entry rules and geographic limits, so be sure to read the rules for each one. This hop starts July 2nd and ends July 9th, midnight. WANT TO WIN THIS Gift Card so you can buy the book of your choice? Way too many books I want to decide right now but maybe a book from one of my favorite police procedural writers like Charles Todd or Ian Rankin. I think I would go for The King by JR Ward. I would get a book by Linda Fairstein, maybe Killer Heat. Thanks for having the giveaway. I have no idea!! So many books, so little money! I'd purchase The Slow Regard of Silent Things (Kingkiller Chronicles) by Patrick Rothfuss. Thanks. I would probably pick a Colleen Hoover book. Thanks for this amazing giveaway - I would love to win and get Doctor Sleep by Stephen King or Scarlet by Marissa Meyer! I would probably get Larissa Ione's Rogue Rider. I'm behind on the series and need to catch up. Thanks! The Yard by Alex Grecian. one of the many books on my wish list! I think I'd use it to pre-order Checkmate by Steven James! Not sure. Probably one of the new science fiction titles coming out in the next few months. Books from my wish list. THanks for the giveaway! I might get Suddenly Last Summer by Sarah Morgan. I have no idea as there are so many books I'd love to read. I guess I'd just randomly pick some off my very long wish list. Smek for President. The sequel I didn't know I needed until I heard it was planned! I might get a copy of Harry Potter & the Philosopher's Stone. Sinner by Maggie Stiefvater. Thanks for the giveaway. I don't know. There are so many that I want. I would like to buy The Body In The Woods if I win. Thank you for the giveaway. I think I'd pick Bittersweet---I just read a very interesting review of it. I might want to buy Goethe's The Sorrows of Young Werther. I will buy Wuthering Heights. I will maybe go for the next book in the Legend trilogy! I really want to get started on this series. I haven't decided yet. I have so many books that I want to buy! Raging Star by Moira Young. I would love to read Sinner by Maggie Stiefvater! I would prefer a book by John Grisham, Jill Shalvis, etc. I'd pick Beloved by Corinne Michaels. I would like a book for my grandkids. Something for my grand-daughter, maybe Goodnight Moon. 6th Grave on the Edge by Darynda Jones. A new Grisham book I haven't read yet. CINDER for sure!!! I wanted to buy that book for ages but I just couldn't find it at my local bookstore. Or The Night Circus. I would buy Daughter of light by V.C.Andrews. So many on my list, but it would probably be Prisoner of Night & Fog, or Ruin & Rising. throne of glass by sarah j maas! Ordinary Grace by William Kent Krueger. I'd get Kiss of Deception because I've heard wonderful things about it!! I would put it towards Transcendence by Shay Savage. I wouldn't buy a single book. I buy books as they go sale for $0.99. I honestly don't because there are so many to get. The Matchmaker by Elin Hilderbrand. I'd buy The Cuckoo's Calling by Robert Galbraith/JK Rowling. The Art of Wishing by Lindsay Ribar. Thanks! I would use it towards a copy of Rusty Nailed. I would probably get the host! I don't know maybe Sinner by Maggie Stiefvater. Maybe the Invention of Wings or Gone Girl in ebook. So many books. I will buy Paper Towns by John Green. Isla and the Happily Ever After! Prodigy by Marie Lu. Thanks for the giveaway! I would choose Hunter's Claim by SE Smith. I think I would buy the Unbecoming of Mara Dyer. Thanks for the giveaway! The fault in our stars by John Green, I am ashamed that I don;t have the book already. I really want to get Dream Thieves by Maggie Stiefvater! I would either like a book about homesteading or raising chickens. I would pick a book in the Outlander series. If I won this gift card i would use it to buy the divergent book series. I'd probably buy Ruin And Rising or Dreams of Gods and Monsters. If I win, maybe I'll get a Joe Hill novel, or something by his dad. I would probably use it towards a new cookbook or a book for one of my children. I would love to purchase "A Cup of Cold Water". My family would enjoy it! I would like to get The Book of Life by Deborah Harkness. I don't know yet. There's so many i want. On the Fence by Kasie West or something by Abbi Glines. Thanks! I might get JR Ward's newest. What books would I get? Not sure but probably something in the Young Adult Fantasy or Science Fiction genre. My favorite. I will buy Mile 81. Caressed by Ice by Nalini Singh. Not Sure, but possibly Rebel Nation that just came out. Thanks! I would choose something in the horror genre. Thank you for the chance to win!! Magic City: Recent Spells by Simon R. Green. I am not sure what book I will get. It depends upon what our next book club selection is. I would get Orange is the New Black by Piper Kerman. I might pre-order Isla and The Happily Ever After! My rafflecopter name is Neira. I will buy an early learner book for my 4 1/2 year-old daughter. I'd love to get Meg Wollitzer's "The Interestings" if I win - thanks! I'd buy Becoming Bea by Mindy Starns Clark. I'd buy whatever new book Jodi Picoult is coming out with next. I would buy Codependent No More. Thanks for the giveaway! I want to read The Secret Diary of Lizzie Bennet. Thanks for the giveaway! I would get the 3rd book in the Divergent series or the 3rd book in the The Selection series. Thank you! There are so many to choose from...probably the newest Janet Evanovich or James Patterson book. Not sure what book I would buy. There are so many good ones out there to choose from! I'd love to get a copy of Hexed by Michelle Krys. Geek Girl by Holly Smale.Thanks! I would buy the book "Golden Girl, by Sarah Zettel"
I would love to get Wings!! I’m so looking forward to reading this one. I'd get Euphoria by Lily King. I would probably get a Luann Rice book. I would probably buy Mary Balogh's new book. I'd get Nora Robert's newest book. I would buy The Fault In Our Stars! I would buy The Book of life. I'll get a Thousand Perfect Things!